I became addicted to opiates. Mainly vicodin type medication. I had some physical problems that led to getting hooked on these nasty things. I also went through some other tragedies that led to even more usage. I have three young adult children whom would have been devasted if they lost their dad at my young age of 54. We have a tremendously great relationship. When I found that I could order these painkillers over the internet my situation began to deteriorate quickly. I knew I was killing myself, not to mention feeling like death warmed over if I went without the painkillers. I was no longer the person God created me to be. I began to cry nearly every night thinking of my kids losing me, not to mention to being able to be alive to enjoy my potential grandchildren. I was at my wits end. I searched the internet and found the Rapid Detox Center. Wow, what a blessing! Money well spent I assure you. It has been three weeks now since my procedure at the clinic. I am my old self again. Happy, full of energy. All of my senses have come back. I can smell, taste and even see better! I began to fulfill my longtime dream of getting my pilots license. I have had two lessons already! I plan on becoming a licensed pilot by my birthday in March of 08. I am no longer a hermit….I am enjoying life again. Walking, riding my bike and playing golf. I love life again. 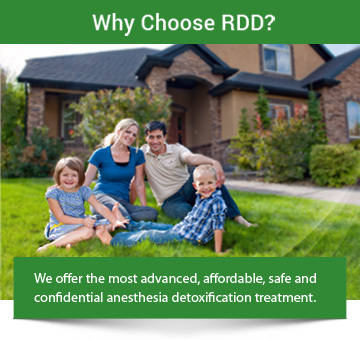 God truly blessed me and my family with my discovery of the Rapid Detox Center. Anyone is always welcome to call me if you want to find out what the procedure entailed…Jeanne, Pamela and Shirley can give you my phone number. Thank you all who were involved with my procedure. You all were wonderful. I truly thank you from the bottomed of my heart.